Laughable, preposterous and therefore perfect for Jesse Ventura, truTV's Conspiracy Theory makes television's dean's list in at least one respect: it's so bad it's good. Ventura, the wrestler turned former governor of Minnesota, takes dumbing down to new heights in this thoroughly far-fetched hour of hokum billed as truth-seeking. TruTV's slogan -- "Not Reality. Actuality" -- should be amended in this case to "Not Reality. Idiocy." It also should be emphasized that Ventura is not acting. Well, actually he is, but he's playing himself in what's supposed to be a non-fiction series. The program's initial target is HAARP (High Frequency Active Auroral Research Program), a military-run facility based in very out-of-the-way Gakona, Alaska. Its website says that HAARP's goal is to "further advance our knowledge of the physical and electrical properties of the Earth's ionosphere which can affect our military and civilian communication and navigation systems." But Ventura and his "team," who gather in the show's "War Room," suspect that the real goal is global terrorism via mind and climate control. An accompanying soundtrack, replete with drum-beating and other notes of urgency, quickly chaperones Ventura and a camera crew to the very gates of hell, where the former Navy SEAL is told by a man with a digitized head and altered voice that he won't be getting an impromptu tour of the HAARP facility. "When I get denied something, I do the opposite of getting intimidated. I get angry," Ventura barks. This dictum is repeated throughout the opening one-hour episode, just in case we don't get the idea that he smells a rat. Viewers might get a whiff of something worse -- pure stinkum. Conspiracy Theory strongly implies that HAARP could be responsible for devastating tsunamis and hurricanes. "Maybe they were just experimenting with the thing," Ventura theorizes. And in the process, "collateral damage" might be deemed unfortunate but justifiable -- at least in the minds of the sinister operatives that Ventura hopes to corner. Several purported experts are interviewed. And Ventura also talks to a suspicious townie with a disheveled beard who says he was "havin' a beer" one night when a fellow bar fly talked about how they inadvertently "fried a guy" at HAARP. Ventura listens raptly before journeying to the home of "respected author" and activist Nick Begich, brother of Alaska senator Mark Begich. Nick affixes a contraption to Ventura's face and tells the former ring villain to stick his fingers in his ears. Ventura then says he hears music coming out of the top of his head. It's supposed to be a small-scale simulation of the mind control allegedly going on at HAARP. But it also might illustrate that Ventura's had his bell rung way too many times. "So in layman's terms, you're almost talkin' about an invisible death ray?" he then asks. "This is the death ray," Begich concludes. Ventura draws his own conclusions, of course. Affixing a glower, he ends this first episode with his shoulder to the camera and his face in viewers' faces. "Bottom line," he barks. "I went up to the gates of the HAARP facility, and they wouldn't let me in. An operation that's run by the Navy doesn't shut out a former Navy SEAL unless they've got something to hide. 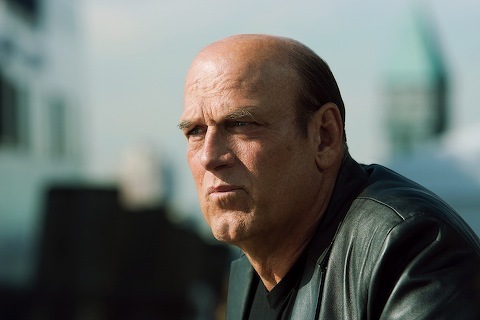 I'm Jesse Ventura. This is Conspiracy Theory." Oh yeah. No doubt about it. Proof positive, baby. Maybe Ventura should try busting into a White House State Dinner on a future episode to investigate what kind of fancy vittles poor old Ted Taxpayer is springin' for. Recent history tells us that would be a piece of cake.